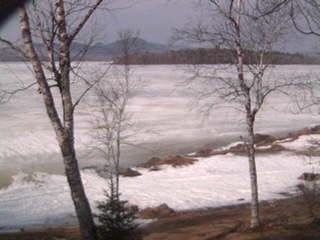 This is a snapshot from our webcam today, March 19,2012. The past few days it has warmed up quite a bit. It rained yesterday morning and then the sun came out. The snow is melting and the shoreline is pretty soggy. Today is is 53 out and only went down to mid 40s last night. So when will ICE OUT be this year:? : Your guess is as good as mine 😉 Last year it went out officially on May 1st. We have all had an incredibly mild winter this year for precipitation but it has stayed pretty cold in Jackman. 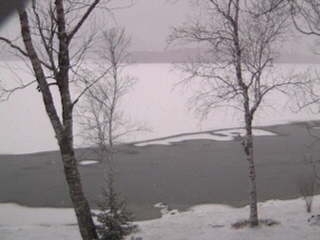 Big Wood has been frozen with a couple feet of ice since the ice fishing season started. Yesterday, most of the ice shacks on Big Wood were coming off the ice. This one was the last one I saw standing but within 30 minutes, it was also gone. It was a perfect morning and a beautiful day. Today it is raining so whatever snow was on the trails, will be gone. Warmer weather due in next week also. 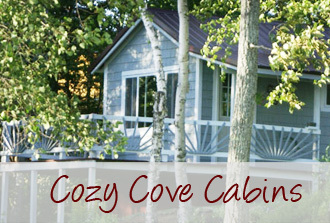 It was an interesting winter and we here at Cozy Cove would like to thank you all for visiting us this year. Get ready for Spring fishing and summer fun 😀 and watch for the ice out contest that will be posted soon. As of yesterday, reports from guests say that the Border loop and up to Pittston Farm run was good. They also did some off trail riding which is also still good. Even though the nights are still cold, the days are definitely warming up, 50s today. 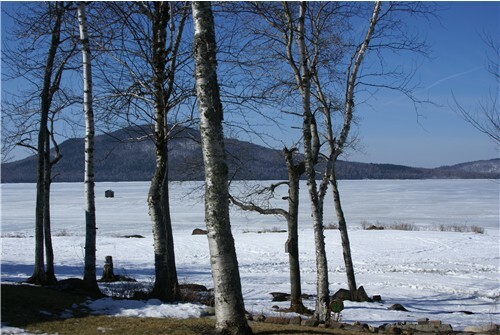 The lake is still frozen but with the warming days, the shoreline may get a bit slushy. Trailer up to the clubhouse is an option. If you want to do some spring riding, this may be the last week for it. I tried to put a nose and mouth in him but the snow is packed pretty hard and I could not get anything to stay. I added the scarf for color. 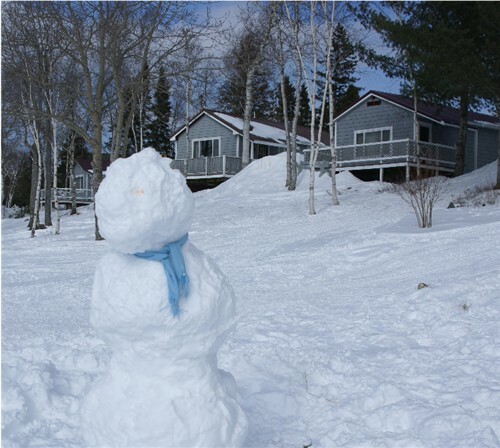 He may be the last snowman of the year but I have a feeling he will be around for weeks. Even though the sun is shining, it is only around 15 degrees. Our snowmobile guests over the weekend all said the trails are awesome north of town and of course, ice fishing options the rest of March. Come on up!